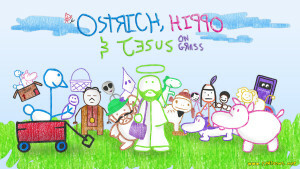 Ostrich, Hippo & Jesus on Grass follows the lives of three friends who spend their time standing in the grass doing nothing. See the gang take on taboo subjects from race to religion to disease along side their pals The Basket, Bobo the Alligator and The Grand Wizard. Join them in an adventure that is sure to bring out the kid in everyone!